Running water is still a luxury. For most of history – and still in many parts of the world – there has been a constant struggle to locate and maintain water resources. Certainly, this has been the history of inland Jerusalem, which, for thousands of years, has been important to merchants, travelers, pilgrims, politicos and residents alike. When the Egyptian Mamluks came to Jerusalem in the middle of the 13th century, they found the public water system in need of rehabilitation. 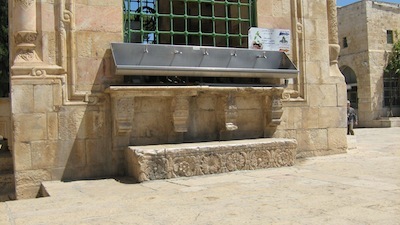 To relieve the weary and the thirsty, Mamluk rulers constructed a series of sabils, or free public drinking fountains. Perhaps the Mamluks repaired or built these esthetically pleasing drinking and washing (i.e. Muslim ablution) facilities out of a heightened sensitivity to the under-privileged. The Mamluks themselves apparently began as young captured or bought slaves, forced to fight, especially in Egypt. While they did not establish social welfare ministries, the Mamluks nevertheless gave alms to ensure water, food, medical care and even (madrasa) education for the poverty-stricken. In addition to providing regular water flow for his sabil, al-Shurbaji built a cistern nearby in order to have water during droughts. The commissioned sabil was actually a single room with a double window on the northern side, covered by a shallow pointed dome. Compared to the ornate designs ordered by earlier Mamluk rulers, Sabil al-Shurbaji’s architecture is simple. According to Dr. Avi Sasson, Jerusalem had some 30 sabils, from the nucleus of the Temple Mount to the surrounding city and beyond. Suleiman the Magnificent – sultan from 1520 to 1566 – built all his sabils at street intersections and at central sites around Haram esh-Sharif, the Temple Mount. Medieval sabils were built on the Temple Mount. Starting in the early Ottoman period, sabils began to spread into the city, following housing development outside the Old City walls. Sabils appeared in three forms: built into a wall; free-standing, sometimes looking like a kiosk; and stylized tanks that required refilling, as they had no constant source of water. In the first two types of sabils, the drinking water came from reservoirs, cisterns or aqueducts. Exquisitely chiseled, these stone fountains sometimes incorporated carved items from other sites, such as the Roman – Prof. Dan Bahat says Crusader – sarcophagus or stone coffin used as a trough at Sabil Bab al-Silsila (Fountain of the Chain Gate), or the Crusader door frame on the Harem’s (1482 CE restored) Sabil Qaitbay (Fountain of Qayt Bay). While researchers know of the existence of 10 sabils on the Temple Mount, Sabil Qaitbay is one of two sabils on the Temple Mount noted for its unique shape. The 1482 CE fountain – which is actually the rebuilding of an earlier sabil of Mamluk Sultan Saif al-Din Inal – has an ornately carved stone dome. Highly stylized Quranic inscriptions run along the top of the structure. Lacking its own water source, the fountain required refilling. The entrance to the fountain structure was from a set of rounded stone stairs on the east side. The eight-sided Sabil Qasim Pasha originally got its water from an aqueduct. Water streamed from openings in the marble slabs. Today, the sabil gets its water piped in from the al-Aqsa Mosque water system. Suleiman the Magnificent’s sabils are probably the best known. 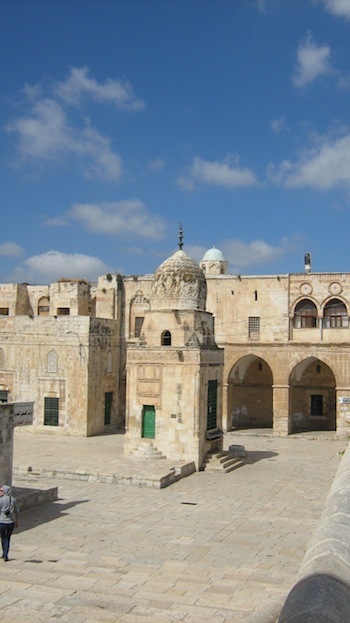 In the past year, the Jerusalem Municipality has restored Suleiman’s Sabil Birkat al-Sultan. The sabil’s stones are now clean and there are spouts for drinking fresh water. Runners in Jerusalem’s Marathon this year could stop at this 480-year-old fountain to quench their thirst. According to a 2009 article in Sustainability by Jamal Barghouth and Rashed Al-Sa’ed, documents show that early in the Mamluk period, Baibars (in 1267 CE) and Mohammad Ibn Qalawun (in 1327 CE) conducted water restoration projects. Rulers, however, soon discovered that keeping Jerusalem water flowing was a demanding job. Upset over their lost income, private water carriers not infrequently sabotaged the aqueduct along its Judean Desert edge. In addition, south of Jerusalem, farmers diverted the water flow to irrigate their fields. To protect the water, rulers stationed guards and soldiers along the line, but that did not totally stop daring water thieves. Even the severe punishments for those caught tampering with the water system did not completely deter people. Eventually, the Ottomans proposed a different tack: in exchange for leaving the line alone, farmers and towns were given tax breaks. Accumulated waste material in the open-air aqueduct eventually caused complete blockage. Suleiman the Magnificent reportedly cleaned the aqueduct and undertook many other restoration activities. Later Ottoman rulers were left to instal a closed line. Eventually, however, the Ottomans abandoned the whole system, forcing Jerusalemites to draw water from wells and local pools until the eventual British Mandate installation of a modern water system. While the Gihon Water Company, established in 1996, lacks the artistic and charitable sense of early sabil builders, it nevertheless reliably supplies fresh water, as well as sewage and drainage services, to about a million people, including Jerusalem residents and those living in Abu Ghosh and Mevaseret Yerushalayim. “Sabils (Water Fountains) of Jerusalem from the Medieval Period to the Twentieth Century” by Avraham Sasson in Water Fountains in the Worldscape (2012), edited by Ari J. Hynynen, Petri S. Juuti and Tapio S. Katko, published by International Water History Association and KehräMedia Inc.